LATHAM -- Major General Ray Shields, the Adjutant General, announces the recent reenlistment of members of the State National Guard in recognition of their continuing commitment to serve community, state and nation as part of the Army National Guard. First Sergeant John Anstey from Holley, reenlisted to continue service with the 222nd Military Police Company. Master Sergeant Stephen Campbell from Lancaster, eenlisted to continue service with the 27th Infantry Brigade Combat Team. Sergeant First Class Jonathon Little from Baker, reenlisted to continue service with the Operations Company, 42nd Infantry Division. Sergeant James Kerr from Buffalo, reenlisted to continue service with the 105th Military Police Company. Sergeant James Farley from Kenmore, reenlisted to continue service with the Company C, Recruiting and Retention. Sergeant Douglas Young from Allegany, reenlisted to continue service with the Company A, 642nd Support Battalion. Sergeant Samuel Marthia from South Wales, reenlisted to continue service with the Division Signal Company, 42nd Infantry Division. Sergeant Victor Husted from Rochester, reenlisted to continue service with the Company E, 3-126th Aviation. Sergeant Joseph Urban from Cheektowaga, reenlisted to continue service with the C Troop, 2-101 Cavalry (Reconnaissance, Surveillance and Target Acquisition). Specialist Matthew Kryszak from Blasdell, reenlisted to continue service with the Company D, 1-171st Aviation Regiment. Specialist Brian Courtney from Buffalo, reenlisted to continue service with the Company E (FSC BEB) 427TH BSB. Specialist Brodie Emmons from Hume, reenlisted to continue service with the 827th Engineer Company. Specialist Brad Eckert from Henrietta, reenlisted to continue service with the Headquarters and Headquarters Battery, 1-258th Field Artillery. Specialist Zachary Slocum from Rochester, reenlisted to continue service with the Company D, 3-126th Aviation. Staff Sergeant Brandan Voss from Lake View, reenlisted to continue service with the 105th Military Police Company. Staff Sergeant Pedro Pabontorres from Kenmore, reenlisted to continue service with the Company C, 101st Signal Battalion. Staff Sergeant Justin Hubbell from Penfield, reenlisted to continue service with the Headquarters and Service Company, 204th Engineer Battalion. 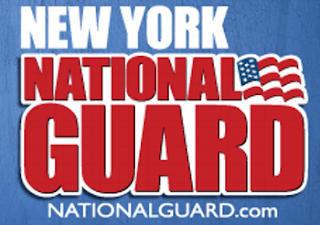 "It's great to see Soldiers staying in the Army and continuing to serve their State and Nation in the New York Army National Guard," Shields said. "The most important Army asset we have is the individual Soldier. The dedication, skills, and leadership traits they bring to our community and their employers are invaluable." "By choosing to stay in the Army National Guard they directly contribute to our nation's security and to the governor's ability to respond to disasters, all while building a bright future for their family through the Guard's retirement, education, and health insurance programs," Shields said.